It helps to know that Jessica Hernandez and her band hail from Detroit. Any city responsible for Mitch Ryder, Iggy Pop, Jack White, the Detroit Cobras and of course Motown is a fertile breeding ground for the soulful pop and rock this group churns out like it was in their DNA. Add that to recording for a label owned by the legendary Richard Gottehrer. He’s the man behind the boards for bands as diverse as the Go-Go’s, Dr. Feelgood, Marshall Crenshaw and Blondie as well as the writer of the classic oldie “My Boyfriend’s Back.” His ears are attuned to great songs and strong female vocals and Hernandez certainly delivers in those areas. 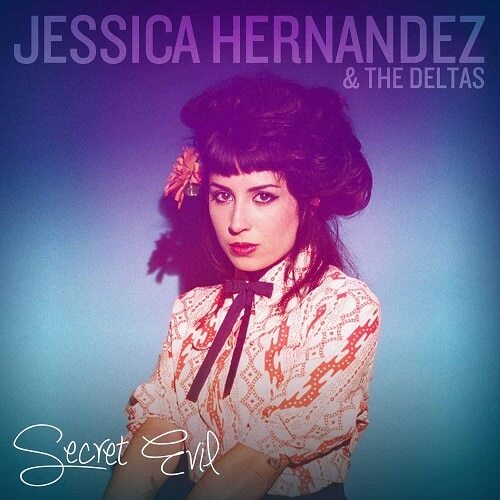 Her feisty voice is showcased on 10 tracks that shift from the tough throbbing rock of “Over” and “Caught Up” to the Latin undercurrents of “Run Run Run” and the melodic mid-tempo pop of “Tired Oak.” Vocally, Hernandez is a firecracker, somewhere between the swinging sass of Imelda May and the leather jacketed swagger of Patti Smith. Her band, occasionally augmented by horns, locks in on a groove that shifts from the guitar fueled funk rock of “Downtown Man” to the fizzy/edgy girl group pop of “Sorry I Stole Your Man.” Even the few ballads such as the closing “Lovers First” fit into the urban mix of street smart swagger that comes naturally to Hernandez. It’s an impressive, often explosive first effort and a reminder that the organic combination of a tight outfit backing a talented, distinctive singer with a parcel of compact, rugged tunes and unaffected production to tie it together will turn heads and rock the house.